With JR-Tech remote IT support, our technicians can access and resolve issues or problems as they arise whether we are in your office or in our own. JR-Tech offers an immediate, secure, and simple option to resolve technical or computer based system issues. Our technicians operate the most recent and most reliable industry standards and infrastructure to ensure the maximum level of security measures and privacy for our users. 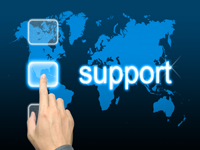 Whether you need a remote support setup for your IT support staff or if JR-Tech is the support staff, the functionality of the remote access will be seamless and will decrease unnecessary downtime related to support issues.